Inside your Kegerator is a one-eyed (sometimes two-eyed) monster that controls just about everything in your draft system except temperature. This is known as the co2 regulator (or gas regulator) and you will recognize it by the pressure gauge or gauges (eyes) that stare out at you whenever you look inside the kegerator. What does it do? Why is it there? How do you operate it? These are the questions that cause concern for new owners as well as some experienced users. The purpose of the regulator is to allow you to control the gas flowing from the tank/cylinder into your beer via the keg. Your gas cylinder contains CO2 at a pressure measured in hundreds of pounds per square inch. This is (1) way too high for pushing your beer and (2) dangerous to work with. Therefore the pressure coming out of the tank has to be controlled and the regulator does just that. Using a diaphragm and a spring inside the body of the regulator it will alleviate most of the pressure coming out of the tank. This way the pressure coming out of the regulator and into your beer is under your control. On the front of the regulator body like the nose on a face is a screw device that is used to adjust the pressure up or down as required. Some adjustment devices require a screwdriver and others may be turned by hand. Many will also have a “lock nut” to prevent the screw device from turning unintentionally. So that once the pressure is adjusted properly, the screw can be locked into place. To adjust the gas pressure going into the keg is simply a matter of turning the gas on at the tank with the cylinder valve, closing the shut-off valve on the bottom of the regulator that is connected to the hose going to the keg then turning the screw clockwise to increase the pressure or counterclockwise to decrease the pressure. Using the pressure relief valve on the keg coupler expel the pressure currently in the hose, then open the valve at the regulator. The gauge will move accordingly. It usually only takes a turn or two and fractions of turns thereafter to adjust the pressure by several pounds. So be careful not to turn too much all at once. Go slow and let the gauge tell you whether to keep going or not. 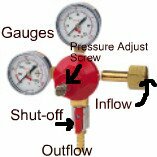 Learn more about what to set the gauge pressure to. Most regulators are only intended for use with Nitrogen or CO2 gas. Do not attempt to use them any other way. Step One: Be sure the gas cylinder is secured to prevent its falling over. Do not rely on the hose to keep it upright. If the cylinder falls the fittings could give way and the unregulated gas will escape. THIS IS DANGEROUS! Step Two: Before connecting the regulator open the cylinder’s valve slightly to clean any contamination from the valve. Turn the pressure adjusting screw or knob to the fully counterclockwise position (zero pressure setting) and close the shutoff valve if it is present. Step Three: Mount the regulator on the cylinder and tighten with an appropriate sized wrench with the gauge(s) facing you and the outlet facing down. Connect the regulator outlet fitting to the product gas hose. Step Four: Open the cylinder valve to the full open position and check for any leaks. If there is a shutoff valve on the regulator open it to the outlet hose. Step Five: Slowly adjust the adjustment screw or knob by turning it clockwise until the desired operating pressure is indicated by the output gauge on the regulator. If you later require a lower pressure setting reduce the outlet pressure to below the new desired pressure by 5 psi by turning the adjustment device counterclockwise. When the pressure stabilizes turn the adjustment device clockwise to the new setting. Step 1: Shut of any of the keg couplers by pulling out and lifting the handle (or for a Cornelius keg by lifting the retaining ring and pulling up on the black quick disconnect). Step 2: Close the cylinder valve by turning it clockwise until it stops and set the regulator adjustment screw or knob to the full counterclockwise position (zero pressure). Step 3: Remove the regulator by unscrewing the nut connecting the regulator to the cylinder using a proper fitting wrench. (The regulator nut is a permanent part of your installation so you do not want to damage it by using pliers or other ill-fitting devices). You may hear a small amount of gas escape as the nut is loosened due to trapped gas in the high pressure side of the regulator and the cylinder valve area. Step 4: Set the regulator down in a safe place so it won’t get stepped on or otherwise damaged while you exchange the empty cylinder for the full one. Then remount the regulator by reversing the steps described above. This procedure applies also if you have just one cylinder that will be removed, refilled then reinstalled.